Ffion Miles has always loved going to rugby matches and has sung on the pitch before a Wales game. But Ffion is blind and takes a radio into the grounds to hear when a try is scored. "You may not be able to see what's going on... but you can feel it through your whole body", said Ffion. Despite calls for better access for disabled people, specialist commentary was only offered to blind French fans during the Six Nations. An estimated 360,000 people are registered blind or partially sighted in the UK, with 100,000 dealing with sight loss issues in Wales alone. While more football clubs are providing audio descriptive commentary, which describes every significant detail of the game, campaigners claim rugby needs to catch up in making matches fully accessible for all. Specialist commentary for blind and vision impaired people was not available for fans in England, Ireland, Scotland, Wales or Italy during the Six Nations tournament. Only the French Rugby Federation (Federation Françoise De Rugby) offered an "accessibility mechanism" for French commentary at the Stade de France, while the Scottish Rugby Union said it was exploring options to introduce the commentary at BT Murrayfield, Edinburgh, and hoped to have it in place in the next 12 months. Ffion, 43, from Llandudno in Conwy county, was born with eye cancer and had one eye removed when she was a baby, while she also has a condition in her other eye. 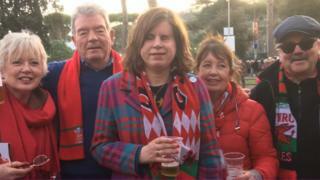 Since going to her first game with her father when she was 12, she has travelled around the world following the Welsh rugby team, and joined thousands of fans to witness them win the Six Nations title at the Principality Stadium on Saturday. "It was amazing, the roars got so loud I couldn't hear my radio sometimes," she said. "You can feel it through your whole body, the tingle. You may not be able to see what is going on on the pitch, but you feel it physically, and you can hear one of the loudest crowds in the world, and it really boosts your excitement." Ffion takes a portable radio with her to the stadium to follow the action, as specialist audio description is not currently provided by the Welsh Rugby Union (WRU), to give her the ins and outs of the action. But the Cardiff Blues choir member said it was a challenge to watch the team abroad, and was unable to follow local club matches as they are not always broadcast. "I went to Rome, but because I was abroad I couldn't use the radio, so I was using my iPhone, but I was 18 seconds behind, which was annoying, so I had to rely on my dad," she said. Ffion said she hoped specialised commentary could be introduced across the nations to allow more vision impaired people to attend games, and understand exactly what is going on. "You could explain to new fans what a scrum is, what a line out is, if you have never seen before you may not be able to picture it," she added. What's the situation in each of the Six Nations? How would you have watched this year's tournament if you were visually impaired? The WRU said it provided radios to fans to listen to commentary at the home games and had been working with charity Level Playing Field to promote access and inclusion for disabled supporters. But the RNIB Cymru said while Ffion had not let her sight loss stop her love of sport, more needed to be done by clubs to make rugby accessible for all. The charity's director Ansley Workman said: "Sport can change people's lives. "Whether you're playing it or watching it, having access to your favourite sports can bring with it enjoyment, fun and even a sense of community. "This is why it is so important that we break down the barriers that exist for blind and partially sighted people accessing sport across Wales." "We know that there is some brilliant work being done in sports clubs across the country, with many introducing live commentary for their matches. This is why we're urging sports clubs across Wales, particularly national teams, to introduce this at their matches and support their supporters with sight loss better."